Being Retro: Bela Lugosi and Me!! Béla Ferenc Dezső Blaskó (better known as Bela Lugosi) (20 October 1882 – 16 August 1956) was a Hungarian actor , who is best known for playing the character "Dracula" in the 1931 film and for his roles in various other horror films. He had been playing small parts on the stage in his native Hungary before making his first film in 1917, but had to leave the country after the failed Hungarian Revolution, and arrived in America as a seaman on a merchant ship. In 1927, he appeared as Count Dracula in a Broadway production, which Hamilton Deane and John Balderston had dramatized from Abraham "Bram" Stoker's novel, where he was talent-spotted as a character actor for the new Hollywood talkies, appearing in the first Dracula film with sound. Through the 1930s, he occupied an important niche in popular horror films, with their East European setting, but his Hungarian accent limited his repertoire, and he tried unsuccessfully to avoid typecasting. Meanwhile, he was often paired with Boris Karloff, who was able to demand solo star billing. To his frustration, he was increasingly restricted to minor parts, for the sake of his name on the posters. Only in 'Son of Frankenstein' (1939) did he perform a major role again. By this time, Lugosi had been receiving regular medication for sciatic neuritis, and he had become addicted to morphine and methadone. This drug dependence was noted by producers, and the offers dwindled down to a few parts in Ed Wood's low-budget movies. Any one interested in the art/design I have done, I am thinking of giving the best comment a 8x10 or 16x20 print of it at the end of the month... big giveaway, if there is interest? 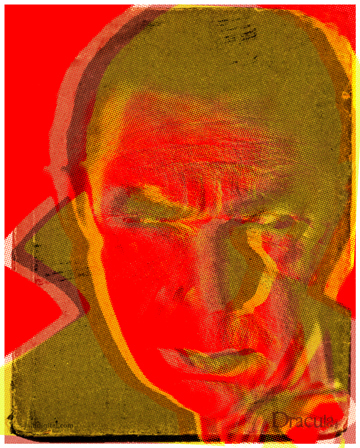 Bela Lugosi as Dracula! Scared the crap out of me as a kid. I wouldn't sleep with the windows open one summer for fear Dracula, as a bat, would fly in and turn me into a vampire. Of course I told my parents I was afraid of a bird flying in. It was a long hot summer. And his life ended in drug addiction - how sad! He may have been shafted then, but we'll always remember him. He was a matinee idol on stage in his native Hungary - (Wiki's a little off up there - not small parts - he was a STAR) he played a dashing Jesus Christ among other roles. He was groomed for romantic stardom at Universal ala Rudolph Valentino, but the thick accent he never lost hampered him. After Dracula it was all downhill, a sad ending for the handsome young man, left working at the end of his life for the eternally upbeat but stuck on the fringe Ed Wood. I have always loved his early movies - The Black Cat, The Raven, Death Kiss - and of course Dracula - a role he only played on film twice - the second being with Abbott and Costello in 1948. He was FIFTY when he played Dracula in 1931, and SIXTY-SEVEN in Abbott and Costello Meet Frankenstein! I try to watch something with him every year during my month-long Halloween Horrorfest. I'm not sure what movie it will be this year yet - but I know it'll be a good one - because Bela will be in it. Your art/design is gorgeous - and I'd be thrilled to have one in my office.